Portrait of a Photographer – Humans of Rice University | My Three Senths: Sports. Business. Life. Until he graduated this year, Soorya Avali and his camera were everywhere on Rice University’s campus. The engineering student turned photographer shot every awesome happening, from birthday parties to the time-honored Beer Bike traditions. Everyone knew him, if not by name, then as “that Indian guy with the camera.” His was lens through which we viewed the school. Consider a shot he took when Rice finally won the Conference USA football championship against Marshall. 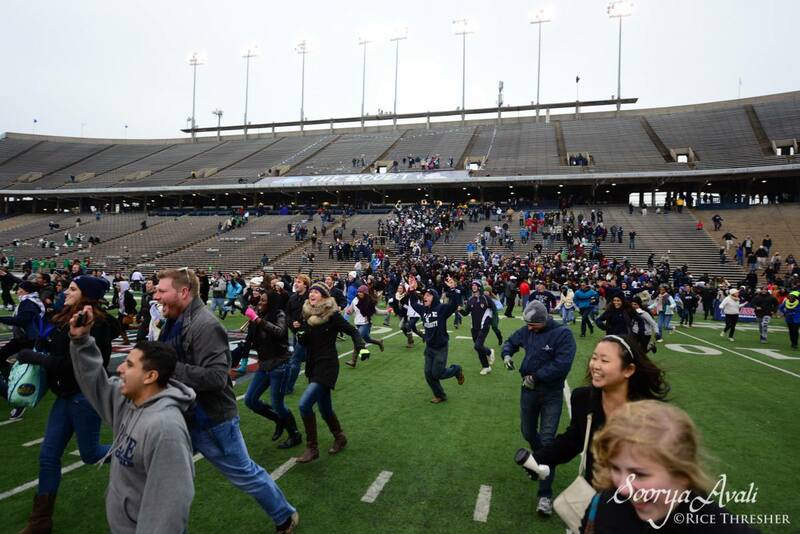 You see the Rice students rushing the field, celebrating the largest victory of their years on campus. You see them as a mass, united. But you see them, too, as indivuduals, relieved and thrilled, vindicated after braving four hours of bitter cold. Every person is smiling. You feel what Soorya himself felt. See, photographers like him are not just documentarians but superheroes with cameras, endowed with the ability to freeze time, to save a moment, to capture forever not just a physical image but emotions. Whenever I see a photo he took of me, I don’t just recall the event, but the feelings evoked by that event, the roads leading up to the moment, the interactions with the people around me, the joys of my freshman year at Rice. A few days ago, Soorya passed away unexpectedly. I am glad to have called him a friend, but really, he was a friend to everyone his camera captured. I’ve struggled to write this in the past tense. Part of me refuses to accept that he’s gone. But in his photos, at least, time stands still. As one of his friends said, lightning is his camera flash now.